“They have poisoned the food supply through negligence, and undermined the farming system through monopolization. As we are awakening to the widespread corruption and inequity that are devastating our economic, governmental, environmental, and cultural well-being, I’ve found it to be highly illuminating to look deeply into our food system and its enormous repercussions that radiate into every aspect of our lives. As I discuss in The World Peace Diet, our unwillingness individually and collectively to recognize and take responsibility for the massive violence required by our food choices is our defining blind spot as a society. Sowing seeds of enslavement, cruelty, and terror in millions of animals who are confined and killed daily for food, we also sow the seeds, unfortunately, of our own oppression and demise. I believe that awakening from the socially imposed practice of eating meat and dairy products is the essential requirement for creating a new cultural foundation where equality, harmony, justice, and freedom are possible. Paying for and eating animal-sourced foods is behavior that is profoundly antithetical to our interests on every level, and increasing numbers of us are realizing that besides damaging our physical health, eating meat and dairy is devastating our environmental, psychological, spiritual, and cultural health as well. However, as the Occupy Wall Street statement implies, animal agriculture serves well to concentrate power and wealth in the hands of elite corporate interests controlling the military-industrial-meat-medical-media complex that profit immensely from disease, environmental devastation, and war. "If It Eats Like a Cow . . ."
In this, our cultural situation parallels that of a typical dairy farm or beef feed-lot, and this is where the poignant riddle comes in: are cows really herbivores or omnivores? They surely seem to be herbivores! We all know that cows have a digestive system designed for eating grass. They evolved eating this way for millions of years in the grasslands of central Asia. Now, however, their diet is quite different. Their owners “enrich” their diet with corn, soy, wheat, and other grains in order to spur weight-gain, boost milk output, and increase profits. This diet is unnatural and causes the bovines to experience digestive distress, including the unnatural intestinal harboring of toxic E. Coli pathogens that sicken and kill hundreds of human consumers every year. However, the riddle goes much farther than this. In addition to grain, agribusiness scientists long ago discovered that feeding cows animal protein, saturated fat, and cholesterol dramatically amplifies milk production, weight-gain, and consequent profits. The result is that for decades now, cows have been routinely fed diets not of grass, but of grain that is “enriched” with the rendered flesh and organs of fish, chickens, turkeys, pigs, and other animals, such as the millions of dogs and cats who are euthanized every year, and the road-kill and other carcasses collected by governmental agencies. Besides feeding the cows and steers all this meat from other species, they have been typically fed the ground-up slaughterhouse by-products of other cows (internal organs, nerves, brains, eyes, etc. ), effectively turning them not just into carnivores, but into cannibals as well. This standard industry practice was supposedly stopped back in the '90s when it was discovered that it caused devastating mad-cow disease in human consumers of cow flesh. Nevertheless, we know that today, cows (as well as sheep, goats, pigs, and other obviously herbivorous animals) are eating huge amounts of meat because it boosts profits for the industry owners and operators, as well as the banks and financial institutions investing in the system. Cows dutifully eat what they’re fed, even when it causes them digestive distress, cancerous tumors, and many other problems. Their owners feed bovines fishmeal, slaughterhouse waste, and other animal-sourced foods not because it is in the cows’ interests to do so, but because they exploit the cows and use them for their own purposes. They also force many types of drugs, chemicals, and antibiotics on the cows, again, not because doing so is in the interests of the cows themselves, but because it is in their interests as owners and investors to increase productivity and profits. Ironically, bovines all die very young: beef steers at about eighteen to twenty-four months, and dairy cow slaves at about four or five years. Though they would naturally live about twenty-five years, they die hanging upside down by one leg in slaughterhouses, stabbed in the neck and bleeding to death, killed for profit by their owners, and for their flesh and skins by obedient consumers. Do cows ever suspect they’re being ruthlessly exploited, or that the meat in their diet is toxic and part of that exploitation? Do they suspect they’re fed meat because doing so benefits their exploiters? After so many generations of being conditioned to eat meat, cows may think it’s their natural food. How would they know differently? 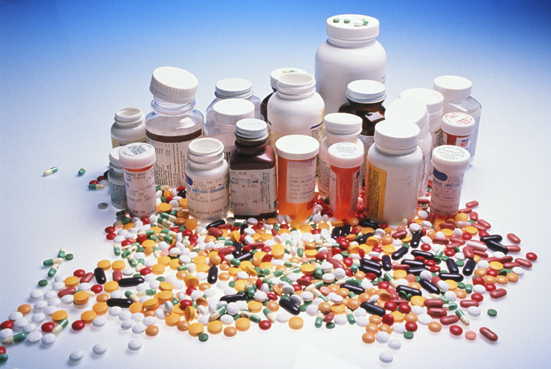 The pharmaceutical-medical complex rakes in billions of dollars in profits from people eating diets high in meat, dairy products, and eggs, people who suffer from and buy drugs to treat the diseases caused by eating these foods: heart disease, cancer, arthritis, diabetes, strokes, obesity, osteoporosis, kidney disease, liver disease, autoimmune diseases, and so forth. This same industry brings in even more profits from people who eat foods sourced from animals who suffer terribly from the terror, frustration, and agony of modern animal confinement operations. Eating food products embodying this depression, anxiety, and insomnia, people ironically spend billions for psychiatric drugs to combat the same illnesses forced on the animals they eat. Drugging animals and humans, the pharmaceutical complex gorges on suffering to amass huge profits that enable it to control governmental bodies, the media, and public awareness. By analogy, the military-industrial complex profits from wars and policies that feed on disconnected, frustrated people, and powerful financial corporations steal people’s homes and wealth as dairy operations steal the cows' babies and milk. We can free ourselves when we awaken from the cultural food trance and its official story line—that meat and dairy are natural for us to eat—and switch to a plant-based way of eating that frees the animals, ecosystems, and people enslaved by this official story. 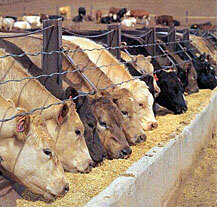 Like cows, being fed meat and cheese is not in our interest, but is only in the interest of exploitive forces. By freeing others, we will attain freedom. By questioning the official food story and going vegetarian and then vegan, we open the door to discovering our purpose on this beautiful Earth, and to being able to create a new world of equality, freedom, and harmony. May we contemplate deeply the riddle of the cows we dominate for food! Are they really the omnivores they’ve been forced into being? Are we?